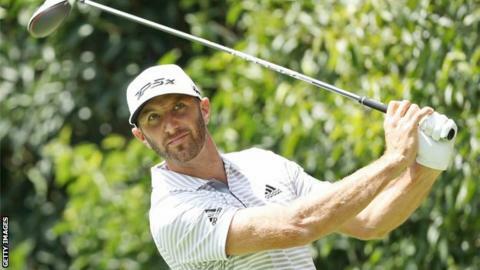 American Dustin Johnson moved four strokes ahead after three rounds of the WGC-Mexico Championship at Chapultepec. The 34-year-old world number three, two ahead at the halfway stage, was six clear midway through day three, posting a five under 66 to reach 16 under. Rory McIlroy remains second after a 68, mixing seven birdies with four bogeys. Patrick Reed birdied the last three holes in a 64 and is nine under, while Tiger Woods had a four-putt in his 70 and is six under with Tommy Fleetwood. The third member of the final group, Matt Kuchar, two off the lead overnight, had three double bogeys in a 79 to drop to one under. Johnson sent his drive at the 367-yard par four second hole only three feet from the flag and rolled in the eagle putt. After eight holes his lead was six following McIlroy's third bogey of the day, but two holes later the advantage was only two. Having gone 45 holes without a dropped shot in the tournament, the twice former champion made a double bogey at the 10th after twice hitting trees, while McIlroy rolled in a 34-foot birdie putt at nine - where he took four putts in round three - and pitched to three feet for another birdie at the next. Johnson responded with successive birdies and added two more on the back nine, while at the last McIlroy saw a birdie chance to cut the gap to three slide past the cup. Woods birdied the opening two holes, tapping in at the first and then pitching to two feet from 137 yards, but he double bogeyed the 15th after taking three putts from three feet, before finishing with his sixth birdie of the day.